Every time I wander the Duty Free shop's whisky aisle -- where age statements go to die and sensible pricing has long since hopped the first flight to nowhere -- the brightly packaged single malts come across exceedingly silly to me, but I'm not the intended demographic. As MAO mentioned at some point, Travel Retail whisky is aimed at flight-weary well-moneyed travelers. I may be the first of those hyphenates, but not the second. Plus I'm immune to lazy product naming and half-assed storytelling. For those who are interested, Edinburgh airport has a sizable travel retail whisky selection comparable to that of the Heathrow and Dublin airports. You may find the shelves a colorful distraction during an extended layover. There was actually a Port Charlotte whisky I would have liked to bring home had I any room in my luggage for another bottle. Since I could not spare a square inch, I instead overpaid for this sampler of Glenfiddich's "Cask Collection", primarily because it contained a peated Glenfiddich ("Vintage"), secondarily because there was also an all sherry-matured Glenfiddich ("Reserve"), and not at all because of the Select Cask. As usual, Glenfiddich took its cue from the Canadian whisky industry by reducing its products to as low as they can legally go, 40%abv. From the creative writing on the back of the box: "At The Glenfiddich Distillery we have an unrivalled cask collection of rare and aged single malts maturing in our warehouses," and, "Glenfiddich Cask Collection celebrates our unrivalled selection of rare and aged single malts at The Glenfiddich Distillery." (Cutting and pasting now, are we?) With all those aged single malts Glenfiddich advertises on the back of the box, one wonders if those casks remain at the distillery since not a single age statement appears on the three whiskies contained inside the box. Glenfiddich Select Cask, 40%abv, from the box: "An elegant single malt, matured in specially hand-selected aged bourbon, European oak and red wine casks and married in our Select Cask Solera vat." Nose - Apples, yeast, saltines, cassia cinnamon, and butterscotch candies sit up front, while a brighter mango-like note rides in the trunk. With some air, it's all butterscotch and tablet, then vanilla and sawdust. Palate - Sugar and vanilla. Sour off-season blackberries overwhelm hints of chili oil and caramel sauce. With air it moves towards even more sugar and vanilla, until a slight eggy sulphur note rumbles up from the rear. The watery texture adds to the off-kilter experience. Finish - Sour berries again, along with tons of vanilla. Then comes the artificial burnt raisin note, which I often find in whiskies heavy on e150a. Some barrel char and an ethyl sting. Eventually it loses the berries, so it's just sour and acidic. Comments: Not much separates the Select Cask from a medium-malt blend and I would be surprised if any of the ingredients ever reached eight years old. Perhaps Glenfiddich had hoped Select Cask would be just a slight step down from the 12 year old, but their foot slipped and they fell down the stairs. Glenfiddich Reserve Cask, 40%abv, from the box: "A rich single malt matured in specially reserved sherry casks and married in our Reserve Cask Solera vat." Nose - Slightly more pungent and sherried than the Select. More nuts and toffee than dried fruit. Barley, brown sugar, and vanilla. Tart apricots. After some air it's all toffee, white chocolate, and vanilla fudge. Palate - Lots of vanilla. Then some more vanilla. Cherry candy, caramel, and a very quiet fresh stone fruit note. With air, it gets slightly yeasty and bready. Grape candy and a bottom shelf Pinot Noir note. Again, a very thin texture. Finish - Mild heat, sugar, grape candy, and a weird buttery caramel note. Also, vanilla. Comments: Likely inspired by the regular 15 year old Solera Reserve release, Glenfiddich went for the full sherry approach here. Yet instead, the Reserve Cask is the step down from the 12 year old that was probably intended for the Select Cask. There is so much vanilla in the whisky that I couldn't help but notice the word "European", present in the marketing script for the other two whiskies, but missing for this one. These sherry casks are more American than Newt Gingrich, and thus similarly limited and loud in the result. Glenfiddich Vintage Cask, 40%abv, from the box: "A peaty single malt matured in hand-selected European and bourbon vintage casks and married in our Vintage Cask Solera vat." Nose - At first there's rubbery peat and peppery breakfast sausage, along with in-season red apples. There's lemon peel, plaster, malt, and hints of raisins. With air, the peat grows mossier and more mature-feeling. Some oregano shows up along with small notes of milk chocolate and vanilla. Palate - Caol Ila-lite, in a good way. Bacon and salt, some seaweed and a spicy zing. Vanilla simple syrup. After some air, it gets a peach note, along with black peppercorns and milk chocolate. Finish - The best and longest of the three finishes. Warm, with peat char, salt, farm, and tart citrus notes. Comments: This has what the other two whiskies are missing: something else, something different from Glenfiddich. A good drink and a bit of a thinker at that, the Vintage Cask has the potential to be great. Whomever came up with the idea for the 51%abv Distillery Edition (and was then summarily fired) could have been utilized for the Vintage Cask, bumping its abv up to 46% and thus respecting the product. But while it sits at 40%abv it never does what other single malts already do, so I can't recommend it at its $100+ price point. At forty bucks, I'd buy it. Even if one's a Glenfiddich enthusiast, as I usually am, there isn't much to recommend amongst the Cask Collection, especially at their $50+, $70+, $100+ prices. If one gets bitten by the Must Buy It Bug, then the set of 50mLs shouldn't hurt worse than $36. 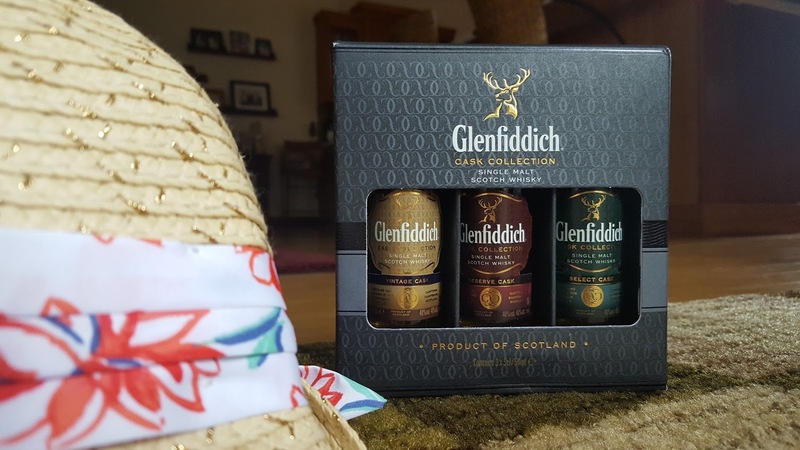 The three-pack provides an expedited path to confirming that Glenfiddich's blenders valued nose more than palate, and "meeting a product deadline" over "thoughtfully expanding the range". The Vintage Cask comes close to breaking free, but all that added water weighs it down. All the buyer is left with is another triple-figure NAS what-if, in an aisle already full of them.